On the train back, Fiz and I sat next to two wriggly girls who'd been put on the train to meet adults one stop down the line, and one of them assured us she was very good at drawing dinosaurs, so I made her prove it. Then we were all surprised when their stop came up so quickly and we bundled them off in a flurry of postcards and drawings. We hadn't realised Steve was on the same train since he'd come straight from his event, but he saw our stuff flying down the platform, texted, and we put two-and-two together that he was somewhere on the train. So then he came and sat with us and I drew portraits of them both as dinosaurs. 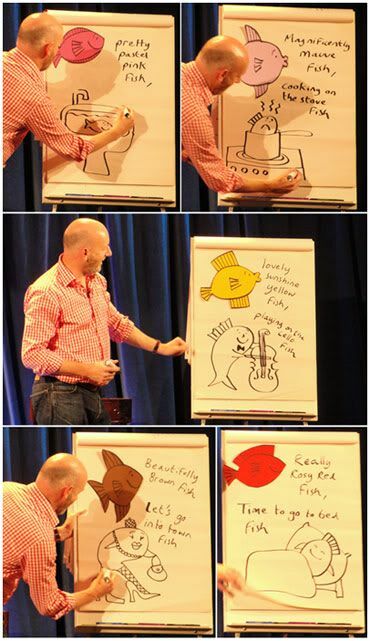 Just before we left, I got to sit in on Nick Sharratt's session, and was very inspired by all the different ways he could turn his books into a live show. Here's a game he played where he'd write the first line of a poem about fish, then get kids in the audience to suggest rhymes for the second line (Pretty pastel pink fish / Swimming in the sink fish, Lovely sunshine yellow fish / Playing on the cello fish). That sort of sums up most of Nick's work: simple but very, very clever and engaging. I think Nick was possibly the first British illustrator I ever heard give a talk, before I really thought it might be a career option. He spoke with Sue Heap at the Illustration Cupboard, maybe ten years ago, and I remember him showing a hugely detailed drawing he made as a kid of his local shopping mall. I've met him a few times since then, but I hadn't seen lead another event, and it was kind of amazing to think of all the things that have happened between the two occasions. By the first one, I think I'd started to hope I might have some books under my belt in ten years, but I wasn't absolutely sure I could do it, and I would've been thrilled to know I'd be doing festival events as well. I was a lot more shy then, and really hated public speaking. 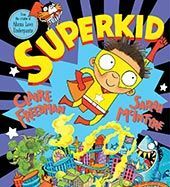 I kind of forgot I was shy along the way, mostly because I realised that the events weren't really about me, but about the kids: they get inspired so easily, and all they really want is a quick assurance that you make books and are a bit famous (ie, more famous than their mum and little brother). Then they want us to make them feel they're special, whether it be admiring their artwork, talking to them or calling on them to say or do something in a big assembly. So taking that into consideration, all I really need to do is make sure they feel involved, and that takes a lot of the pressure off me to have to be an amazing performer. 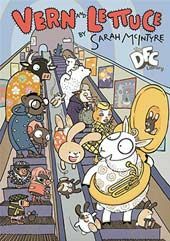 One of Nick's counting books features sheep having a jam session at the end, and he wrapped up the hour with ten kids wearing sheep masks and rocking out with plastic air guitars to a musical rendition of his Pants book. The masks made it look slightly Wicker Man, but fabulous. Our Scholatic and Random House publicists, Fiz and Rosi Crawley (Random_Rosi on Twitter), had a big love-in over dinner last night, with Steve and Edinburgh-based Princess Poppy writer Janey Louise Jones, who was wearing a vintage gown that her husband had tailored to a perfect fit (cool!). 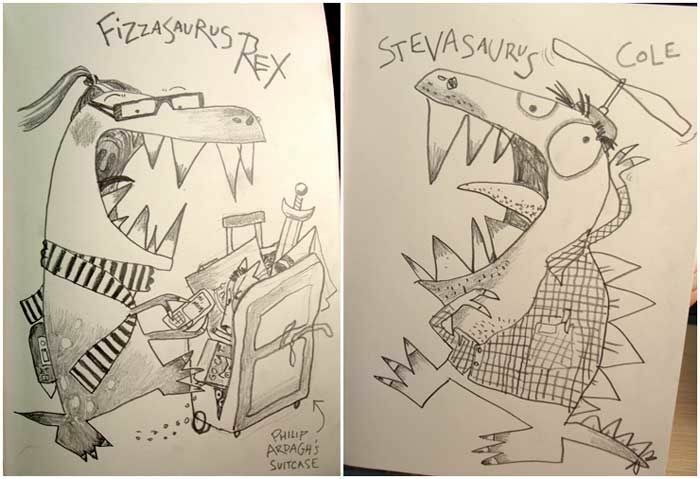 Both Janey and Steve have written a lot of books, and my jaw hit the table when Steve (Astrosaurs, Cows in Action, Slime Squad) told me he pumps out about twelve books a year. Taking publicity events into consideration, I think even two books isn't easy! Talk about FOCUS. Whoa. 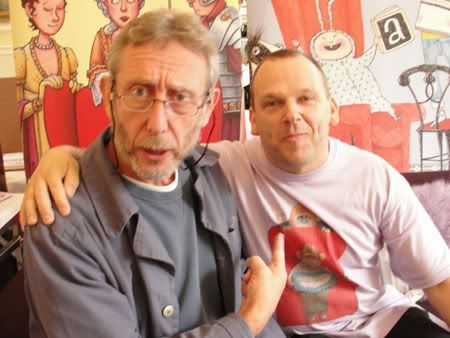 I saw former Children's Laureate Michael Rosen in the Green Room, hard at work in his tireless pursuit to turn curmudgeonliness into an art form, until festival organiser John McLay spoiled it for him by walking over and sitting down right in the middle of the newspaper he was reading. Then John and Gill's kid toddled up with a half-eaten biscuit and Michael had a brief conversation with him about football scores. Thanks so much to Gill and John for inviting me, and to everyone who's been working so hard to make this festival such fun and run so smoothly! 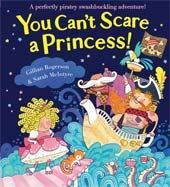 My Aliens event went wonderfully, and I was thrilled to have a kid in the front row who knew every word of You Can't Eat a Princess! ; we got a funny little patter going. 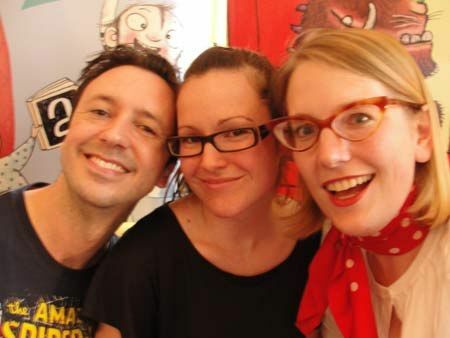 And I got to meet Mélanie McGilloway , Oisin and Rosalie from Library Mice, good stuff. I wasn't going to post any pages from The Pickle until I got the website launched (just bought the domain picklerye.com yesterday!). But I couldn't resist showing the very first one, a sports page, that's come through from Manchester-based Rick Eades. Rick's amazing, I've been following his comics for awhile now. Thanks so much, Rick!!! This is brilliant. And several thanks due for fab reviews! 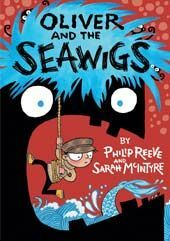 First to the super-impressive Philip Reeve for reviewing Vern and Lettuce on The Solitary Bee. Aw man, everyone knows I think Philip rocks! And to DFC teammate Neill Cameron for posting his pictures of Vern and Lettuce riding Mo-Bots, hurrah!! Don't miss his amazing comic in the DFC Library series, Mo-Bot High, launching 28 Nov. And to our fellow teammate Dave Shelton (Good Dog, Bad Dog) for his plug. Yay! And to Nottingham's Game City for their support and Jeremy Briggs (whom I met in Edinburgh) for his kind words on Down The Tubes! A note from Andrew at Gosh! Comics, they're very willing to ship internationally their special 200-limited bookplate editions of Vern and Lettuce if you want to order copies from overseas. Email him at info@goshlondon.com for details. 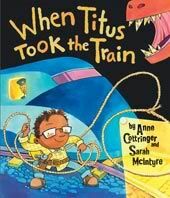 I'm just starting to get reviews for my book with Anne Cottringer, launching this Thursday, When Titus Took the Train. 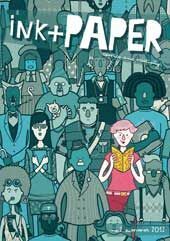 Here's a review from thebookbag.co.uk, thanks for that! 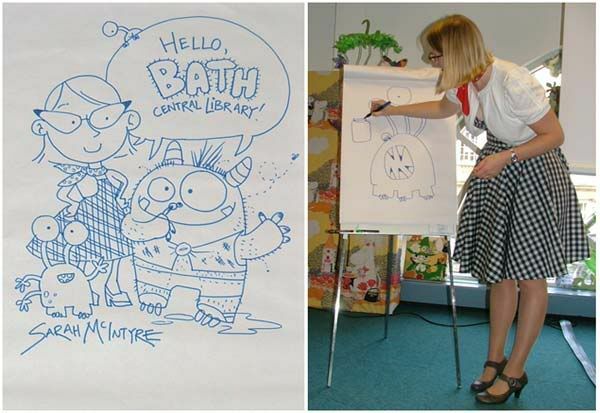 Edit: Read Steve Cole's account of the Bath Kids Lit Fest over on his blog here! Although I know you have a lot of fun I am completely amazed at how hard you work! I applaud your energy level. Aw, thanks! I'm a bit worried about crashing after all the October events, but I'm taking lots of vitamins and trying to get good amounts of sleep to get through. And they're really fun, which helps offset things like shlepping around with luggage. It was great to meet you at last and Rosalie and Oisín are so pleased with their signed books! 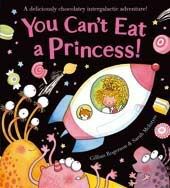 I think I'd struggle with going the whole way with the princess thing, but the aliens and space aspect of You Can't Eat a Princess! rescued me. We went well into Morris territory with those aliens, heh. Thanks for your great reviews! And hope to see you in Oxford.